The newsletter was written and released. I had made a consciously personal investment in the content with the intention of sharing value with my readers. In truth, I felt great about it when I hit that publish button. Then, the emails started arriving. One after another. Unsubscribes. And my heart sank. Maybe it was the exact situation. Maybe it was in some other way that you risked vulnerability to share yourself in a more visible way. Whatever the situation, it felt like rejection and it hurt. Compare that to the opposite scenario. The feeling is so different. We celebrate with excitement (and perhaps relief). Somebody likes what we’re doing and wants more – and this gesture is our proof that we are of value. More please, we say. In both situations and with two different results, YOU, and your value, were exactly the same. To embrace that insight with humble confidence can be freeing. Reflecting on what leads us to feel proud, confident, and worthy – if we could believe that we are good enough as we are – would such gestures as described above, whether we perceive them as being positive or negative, hold such emotional weight and significance for us? 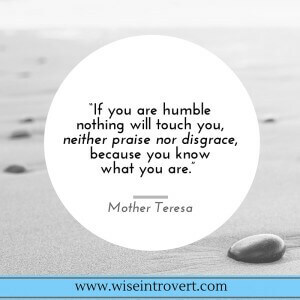 And if, as in the Mother Teresa quote, we knew who we were outside of these ways that we tend to measure ourselves, how would we interact differently in the world? Could our value remain in-tact despite whether our kid excels or struggles at school? Could we feel equally confident and grateful for the unsubscribe as the new subscribe? Could we experience abundance and not feel the need to be flashy? Could we be confident in our offerings AND not feel the need to tell (or convince) potential clients that our product/service is the best, that they deserve it despite the cost, and that it will resolve their problems more than any other – aka it will be the magic solution, the last product they’ll need? Could we present ourselves with pride and humility, creating meaning and impact, while living a small happy life without having to push? Could we feel more confident to try that thing we’ve been curious about for so long? That new subscriber (or whatever the equivalent is to you), while she may perhaps have something to do with your income one day, has nothing to do with your value. Don’t measure yourself this way…To measure yourself in this way is to do yourself a significant disservice. Wise Ones – sit with this. Then show up in your own right way. Be Brave. Be Seen. Be True. Be YOU. Need help with decision making? Try this.